Happy Monday Musers! 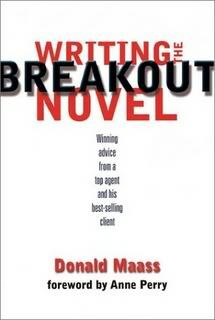 I just wanted to mention I have a guest post up over at Editor Chuck Sambuchino’s Guide to Literary Agents Blog on Blogging Platforms, taking the principles of Donald Maass’ Writing The Breakout Novel and applying them to blogging. If you are looking at starting up a blog as part of your writing platform strategy or have a blog now and want to strengthen it, please do check it out. There is also a wealth of information at the Guide to Literary Agents Blog on all topics pertaining to writings and publishing, so make sure to poke around a bit while you visit! This entry was posted in Blogging Tip, Platform. Bookmark the permalink. Steve, excellent and very relevant question. Like you, I am also an aspiring writer who will be targeting children and teens. That market is very, very important. However, without a book in hand, I have very little to offer my eventual readership at the moment, right? So, without a product to sell, the best thing we can do is to promote our name within the industry. We need to create BUZZ even before our product hits the shelves because it will influence the gatekeepers to our eventual readers. If other writers, authors, editors, agents, and booksellers are hearing our name being promoted through our personal network, it helps us stand out from the rest. It will influence sales and exposure. Writers become the obvious choice for a network, because we are all climbing the same impossibly steep, lava-spewing mountain. We understand each other and empathize with the ups and downs of the journey. By sharing what we know, we create a community environment where we become invested in each other’s success, not just our own. And once we do succeed, there are no louder cheerleaders out there than other writers. Writers/bloggers are critical when it comes to spreading the word about our book. Think of the blogs you visit written by writers. In addition to writerly advice, chances are they also review books, make book deal announcements, host guest authors, do book giveaways, etc. If you work hard to build a network of writers NOW by creating blog content that brings people back again and again, you will forge personal connections with people like this who will help spread the word about your novel when the time comes. The better your network, the more exposure you’ll have of your book and name. The more people know your name, the more they will seek you and your work out. So yes, reaching our eventual market of readers is important, but cannot be optimized until we have a sale ready to promote. However, no matter what our genre/readership is, we NEED a network of people to help us launch our book when the time comes, and it is something we can (and should) build immediately, even before a sale. I am a firm believer in giving what I know freely (knowledge, encouragement, mentorship, friendship). In return I’ve already gained much, and met many, many wonderful people. I cheer at every success and am happy to help in any way I can. I hope that some day some of these wonderful people will help me make sure my debut is as strong as it can be. I’m catching up on posts I’ve missed, and just saw yours at GLA. All the advice seems good, but I think I sense a disconnect. As an aspiring YA writer, my prospective audience is the demographic of the teens who frequent the YA shelves at Barnes & Noble, and their extended cohort. However, your blog platform advice seems to imply that one’s blog audience should be drawn from the community of other writers – who are not the same demographic at all, except perhaps incidentally. Something doesn’t seem to compute here. Can you help? Excellent post! Very helpful for those who wonder how to get anybody to read their blog. CR, nice to see you here! Danyelle, Bish & Conda, thank you all! Jill and Erin, I’m so glad the article helped! Henya, thanks for the visit. And I agree, this is one to reread often. There’s always more I can get from it on each read, always more to absorb. Laustinspace–thanks for the link! I was by a few days ago and my computer wasn’t letting me comment. I think it’s great how you and your better half are writing a book together! I’ll visit again soon! Marian, I agree, it applies to both. I love all the passion I see in blogs. Thanks everyone for the great comments! I enjoyed reading that, Angela. It’s great advice for writing or blogging: specialize, provide consistently and enjoy what you do! I’ve loved your blog since long before creating mine. I use your thesauruses ( thesaurusi ?) all the time. This one, and Chuck’s, just made me order the Breakout Novel from Amazon. Don’t ever quit, Angela, we’d all be lost without you! Wonderful post! I left feedback on GTLA’s website as well. WTG!!! Whew – saved by the bell! Your advice about blogging gave me food for thought. I have a number of blogging buddies who are encouraging me to start my own..BUT…I’m glad to have refused to do anything rash or hasty. I bought the book a few months ago. I agree that every writer should read and re-read this book. Loved your post! Well done! Thank you so much for writing the post about blogging!! :o) Having a web-presence is a definite advantage for writers seeking representation. My own blog needs work, but now that I have read your advice I feel like I have some direction! Thank you!! Cool idea. I’m off to check out the article! A most excellent article Angela. Good job! Great book on writing, and fun idea to apply it to blogging, it sure is relevant. Probably one of the top five current books on writing as well, for those who haven’t read it. Not necessarily in that order. I’m sure there are others but these have helped me a lot. Thnx for the link! I’ll have to check this out! Thnx for the link! I’ll have to check it out! Shannon, I agree. I don’t know how people get by without the kindness of industry blogs. There is just so much to know and keep up with! Thanks for visiting, Chuck! We love you here at The Bookshelf Muse! Saved — wondering how many would read the blog without commenting. It was a wonderful post! Very cool, Angela! He has a rocking blog, but then so do you.